Most of us have fond memories of our grandmothers and a big part of those memories are linked to food. I guess the most pampering happened through food, followed by bed time stories and snuggling up to their softness in the night, and of course protection from the parents' scoldings and spankings that invariably followed all our mischief. 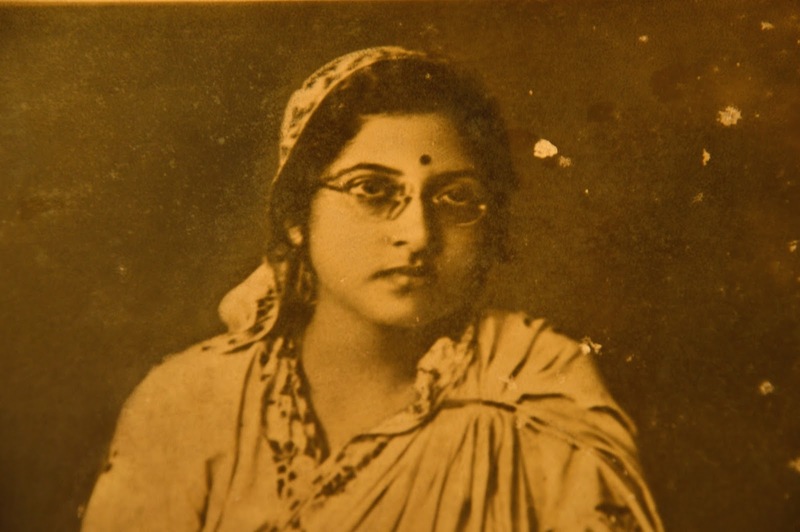 Since my parents moved to Bombay I got access to my grandmothers only in the summer holidays when we went to Calcutta. Needless to say the pampering was even more because we weren't around all year through. My Didin, mother's mother, and her sisters married into the same family, marrying brothers and cousins. Consequently they all lived quite close together and whenever we visited it was like having multiple grandmothers to indulge us in every whim. There would be umpteen unplanned meals, teas, and treats, and then there would be the planned and orchestrated meals where I would expect to be served on banana leaves with terracotta bowls and glasses to complete the experience. The thing is, we invariably missed most family weddings thanks to exam schedules and this was our chance to experience the traditional spreads at least to some extent. The grand uncles would be packed off to the market and the grand aunts would sweat over the hot and smoky 'unoon' (clay coal-burning stoves)cooking for us spoiled brats. At lunch time we would be seated at the table, just my brother and me, and we would be fed a royal repast - the menu decided by us of course! On the road leading from Didin's house to her sisters' house (three of them lived in a large house divided into three portions) was a coal shop that also stocked soft drinks. This was another great source of indulgence as we would often stop at the shop and share a bottle of Campa Cola or Rush or Limca. It was taken for granted that some uncle or aunt would pay for these! Soft drinks were never permitted by the parents in Bombay so the few we had from this coal shop were treats of the highest order! This same road housed many momo shops, some of which are now very well known. Though the grand aunts, Didin, and in fact, most of the women in the family including my mother looked down their noses at the food from these shops, occasionally one of the numerous uncles would indulge us with a plate of hot steaming pork momos and the inevitable plate of chow mien. My fondest memory, however, is of the stolen half-fried potatoes. 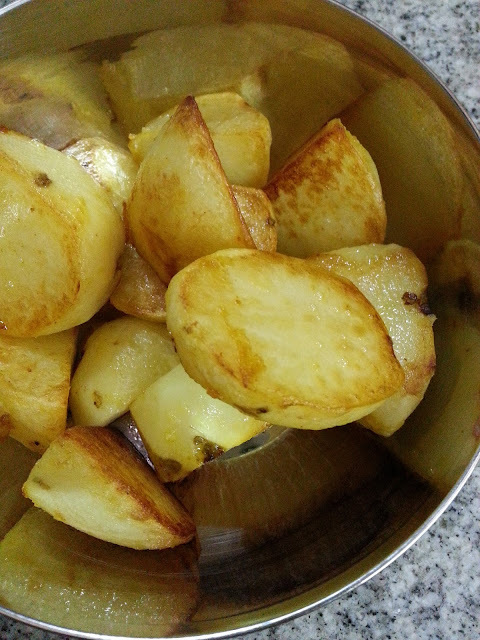 Potatoes are always present in some form or other in Bengali meals and Didin was always frying them for use in various vegetable preparations or the mutton or fish jhols (stews). Potatoes would be peeled and cut in specific shapes and proportions for the dishes of the day and would be lightly fried and kept aside. Oh the joy of whacking a piece or two! These would be semi-fried and not quite cooked through so once in a way if you chanced upon one that was completely fried it was heaven! I was indulged even more by my Thakuma - dad's mother. I was the first granddaughter after a long string of grandsons and I was spoiled thoroughly by everyone. Thakuma was a strict matriarch and ruled her daughters in law with an iron hand. She supervised the cooking of all the meals and her daughters in law assisted and worked under her instruction. She would sit at the unoon and proceed with the cooking and one of the things that was a daily affair was frying potatoes. The fried potatoes would be lifted out of the hot oil and placed carefully in a stainless steel bowl waiting to be added to whatever dishes they were set aside for. One day as she cooked she reached for that bowl of potatoes only to find it missing. I was discovered sitting under the dining table, hiding behind the chairs enjoying those potatoes. I was a toddler then, and Thakuma was so amused and pleased with her apparently faultless granddaughter, from then on she would fry a small bowl of potatoes and leave them aside for me to find. Such a lovely post, Rhea. I was remembering my grandmother last night and your post brought back some food memories too.